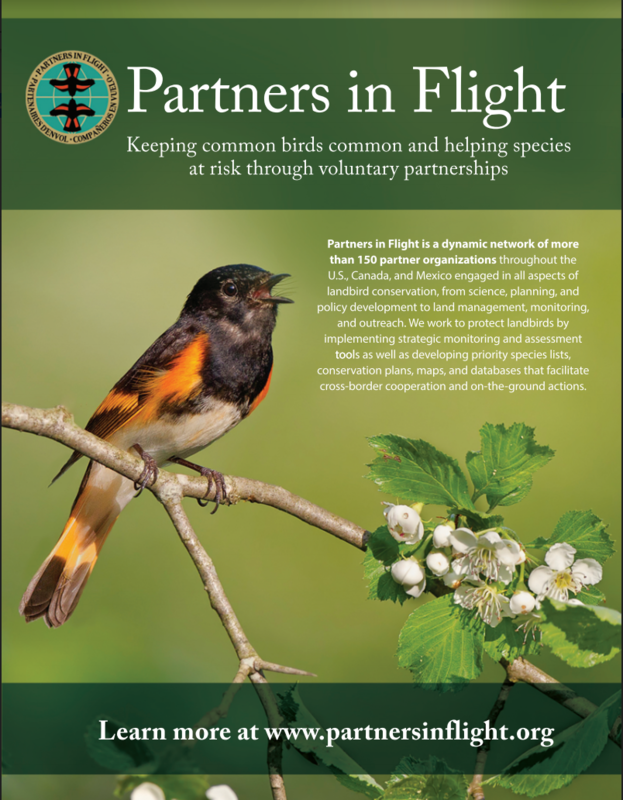 Over the past decade, Partners in Flight (PIF) has increasingly recognized the importance of understanding and addressing issues faced by migratory birds throughout their lives and during their full annual migratory cycles. 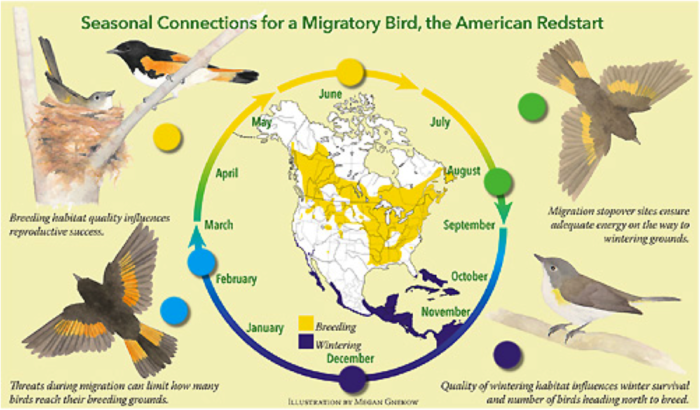 Full life-cycle conservation of migratory birds requires actions that provide habitat and reduce mortality throughout the year and across the globe, wherever the birds might go. Of the 286 migratory landbirds breeding in the U.S. and Canada, roughly 56% winter primarily south of the U.S. in one or more Neotropical regions. Striking new results illustrate that where a species spends the winter may be a better predictor of population declines than where it breeds. 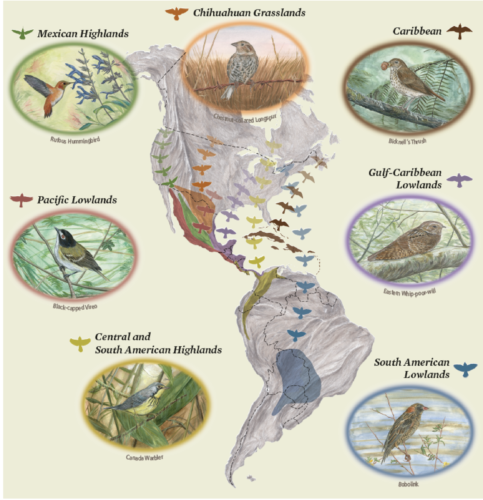 For example, species wintering in Chihuahuan Grasslands of northern Mexico, Central and South American highlands, and South American lowlands are experiencing steeper declines than species wintering in other regions. 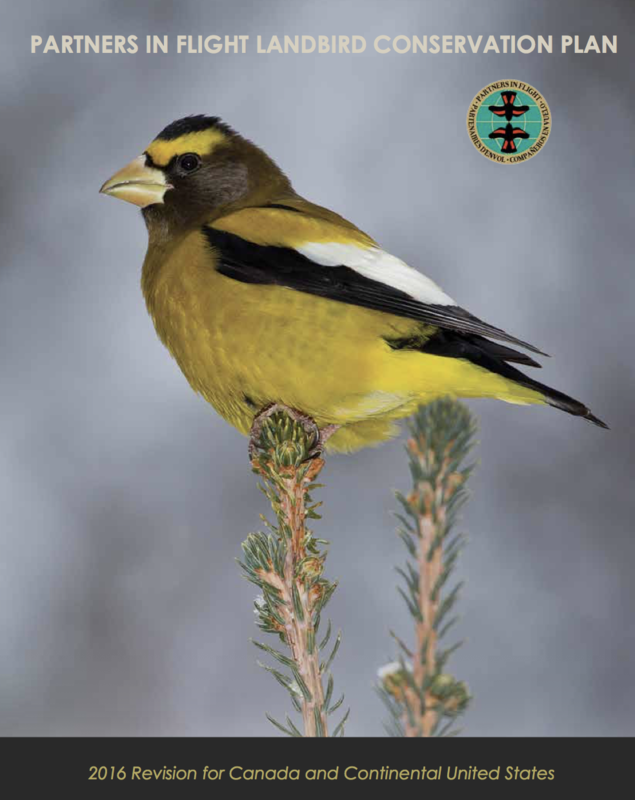 The PIF Landbird Conservation Plan (pp 20-23)provides information and recommendations for North American landbirds across their full annual cycles. Using models of predicted abundance based on year-round data from eBird, PIF identifies the most important areas for Watch List species during the breeding and non-breeding seasons. For example, Belize, Guatemala, Honduras, and the Caribbean lowlands of Mexico are most important in winter for Wood Thrush. New metrics derived from these models indicate that Wood Thrush spends 40% of the year on their wintering grounds, and that they are packed into a much smaller area in winter—in fact they are 24 times more concentrated on their wintering grounds, greatly magnifying the threats from loss of tropical forests.